Don’t worry. We don’t want your money. We want your ideas! In March 2014 18 recommendations from a subgroup of Councillors about how the Council would “do” sustainability differently were agreed. Council officers were asked to make an “implementation plan” to turn those 18 recommendations into reality. In June they presented their version – and were told to go away and beef it up; councillors felt that the plan wasn’t sufficiently “SMART” (specific, measurable, achievable, realistic and time-framed). Officers presented a re-done “implementation plan” in September. And were sent away AGAIN by the Economy Scrutiny Committee! This left citizens of Manchester who care about its future with a simple choice. We could wait another 3 months before the third version of the implementation plan came back to Neighbourhoods and Economy Scrutiny Committees, with no guarantee that it would be acceptable to the councillors. We could write an implementation plan ourselves, and then present it to councillors. Four of us met last Sunday and came up with some draft ideas. Since then three other people have made major contributions to it. Sorry it’s so brief, but we want to get this out to councillors well before they meet on Tuesday 21st September and Wednesday 22nd September (2pm and 10am respectively – Neighbourhoods Scrutiny and Economy Scrutiny). The Manchester City Council (MCC)’s Environmental Sustainability Subgroup completed its work in January 2014. In March 2014 MCC at both Neighbourhoods Scrutiny Committee (NSC) and Economy Scrutiny Committee (ESC) agreed to implement its recommendations. But both attempts to create an implementation plan have been rejected by Economy Scrutiny as unsatisfactory. Rather than wait for a third attempt, a group of Manchester citizens has decided to write a plan and circulate it. This is done in a spirit of constructive criticism, imperative because of the enormous challenges of the linked crises in environment (including climate) and economy facing the city. Given the workload that would be generated in completing the 18 recommendations, a short-term solution might be to re-establish an Environmental Sustainability Subgroup/Standing Group. We believe that the only viable long-term solution is to create a seventh Environmental Scrutiny Committee. how we propose implementation is measured so scrutiny committees can scrutinise what happens. Time Bound – so we know when it should be done by. Recommendation 001: When the Community Strategy is reviewed, more consideration is given of what makes for “good growth” for Manchester. To include the support and advice from local experts and interest groups such as the CLES (Centre for Local Economic Strategies), CRESC (Centre for Research on Socio-Cultural Change), the Tyndall Centre, Steady State Manchester and MERCi (Manchester Environmental Resource Centre initiative). Could this recommendation be improved/extended? “Good growth” is an entirely understandable wish, but risks being an untenable compromise or “greenwash”. Members are invited to read this article from the Steady State Manchester website. It might be more appropriate to use the term “selective growth”. All the above-mentioned groups, and others, should be invited to participate fully, not in the final consultation stage (May-June) but from the very initial process of the Manchester Leadership Forum Strategy Discussion Forums (September to November). Members of the ESC and NSC with an interest should also be able to attend. Who else might be able to help the Council complete this recommendation (locally, regionally, nationally)? How can this recommendation be completed in ways that improve the Council’s external relationships, and increase the ability of other stakeholders to engage with it? What will this look like – what will be different after we have taken action? A Strategy that is more likely to be an authentically “Community” Strategy, that embodies the real and “wicked” tensions in ensuring economic and social success with ecological safety. A working definition and consensus on what growth is and is not desirable for the City. If that’s not possible a clearer statement of what the Council is pursuing. How will we know in six months how much progress is being made? What is the next/immediate action? Build links between these groups and individual councillors on the ESC and NSC; by inviting the groups to attend ESC/NSC, by members of the ESC/NSC attending their events. Create a video about the MLF, and the Manchester Strategy that is circulated widely. “Work” is a relatively nebulous term! Is So we propose this made more SMART, with e.g. Make sure that the input of the local groups is advertised, and that there is a way for unaffiliated members of the public ALSO to input BEFORE the consultation process in May-June next year. Perhaps the Environmental Sustainability Subgroup needs to be re-established as an “Environmental Standing Group”, with a specific remit to drive forward the 18 recommendations? There will be some confidence that the dashboard measures of economic, social and ecological well-being actually reflect what they are meant to (“construct validity”). We can point to the number of people who have visited the relevant web pages of “the Manchester Partnership”, how many people have attended meetings, submitted comments, watched “basic explainer” videos. There will be an agreed basket of measures, with a consensus summary of their degrees of dependability. Accelerate the development of the monthly Environmental Dashboard so that it is in place as of November 2014 Review the dashboards for Economic and Social Indicators to ensure they reflect true economic and social well-being. Invite all named groups to be involved now. Recommendation 003: That follow up work includes consideration of the economic impact of the green industry, including sustainable energy and the jobs market. It hasn’t really defined “green industry”. Does this mean renewable energy? The green building sector/retrofit? Local food? Something else? The report that came to Environmental Sustainability Subgroup should be referenced at this point. A shared, quantitative, understanding of the prospects of local ‘green industry’ to help in the greening of the economy and producing collateral social benefits. Recommendation 004: To recommend that when Economy Scrutiny Committee considers how local people benefit from economic success, environmental benefits are included. The environmental costs should also be considered? ESC should also be looking at economic ‘failure’ – otherwise their analysis will be incomplete and ‘celebrationist’. The promised quarterly reports on the Climate Change Action Plan would be a good start! Improved communications by ALL scrutiny committees. More informed discussion at committee on the environmental impacts of economic activity. Reports coming to Environmental Scrutiny Committee include this as of December 2014, using a standard framework for reporting (which will include identification of aspects where information is not available to answer the questions)..
(Recommendation 17 is distinct from this, as far as we can tell) – make available a standard summary front sheet for reports to committee with spaces for this information. Recommendation 005: To recommend that the Environmental Strategy team lead on influencing officers to consider environmental matters in all relevant decisions through ward coordination. Need to assess how realistic this is, given the workload and capacity of the Environment Strategy Team and the number of wards they would have to cover. There is also a need to influence officers outwith the ward coordination process – since most decisions are not taken at ward level. Using social media, creating basic materials that explain what the Council is already doing on environmental matters and would like to do, in a variety of languages and formats. Perhaps the “Eco-neighbourhoods” concept already includes this? It’s hard to tell. 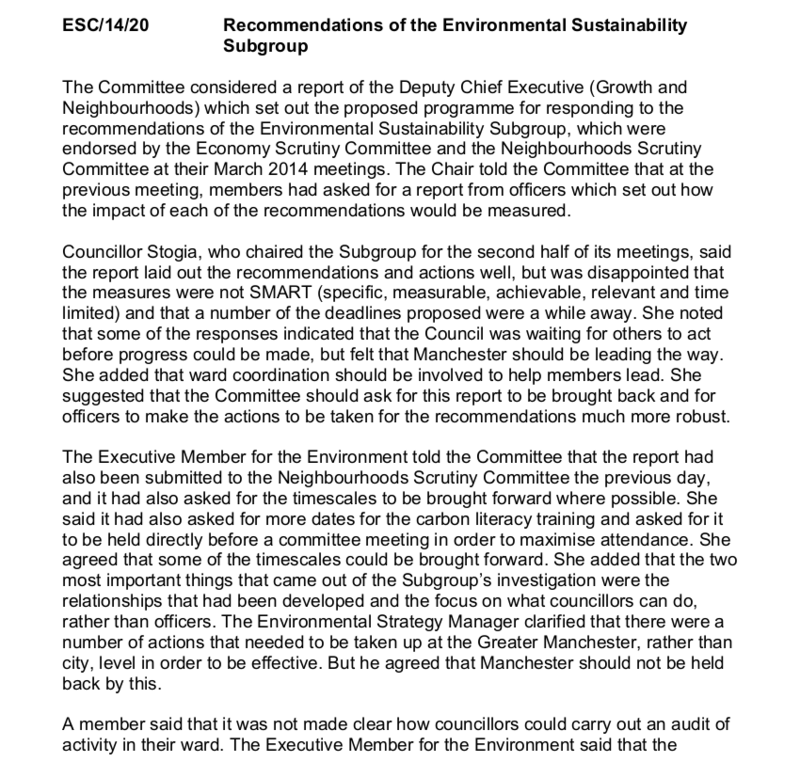 Get a report on the “Eco-neighbourhoods” “concept” presented to both Neighbourhoods and Economy Scrutiny Committees as a matter of urgency. Recommendation 006: To recommend that the Environmental Strategy team facilitate workshops for councillors to help them understand how they can make a difference and equip them with the skills and knowledge to work with groups and individuals effectively. For the workshops to include how councillors can use their links to social housing providers and other key partners and practical examples of changes that can be made. This needs to be broken down into “face-to-face” skills and “social media” skills. Does it mean ALL councillors, or just councillors who sit on Neighbourhoods and Economy? Why does it have to be Environmental Strategy Team? Given that they have subcontracted out the Green and Blue Infrastructure Strategy, might it not also be a good idea to sub-contract out this? The skills required here are a little complex, combining change management, local democracy, specific policy areas such as housing AND environment – it needs some thought as to the appropriate skills mix. Academics and other groups (Friends of the Earth, Action for Sustainable Living, Steady-state Manchester, Cooler Projects etc) could be asked to facilitate short workshops before/after ESC and NSC. Tyndall Centre or Sustainable Consumption Institute academics could be invited to deliver seminars as requested. The workshops could be open to all, and the outcomes circulated. Some kind of open-forum – a ‘safe space’ to explore ideas and reflect on policy and practice might be worth trying. That way there can be mutual support of among all parties on this difficult agenda. Representatives from social housing providers could explicitly be invited to attend. Start holding workshops before or after Scrutiny Committees, as of November 2014. Obviously attendance will not be 100%, but that’s not the point! Recommendation 007: To recommend that councillors carry out an audit of all the work, projects and schemes in their wards on environmental and climate change action. Again, does this refer to ALL councillors, or members of Economy and Neighbourhoods? Greater Manchester Ecology Unit, Association of Manchester Open Spaces Societies (AMOSS), Friends of Parks groups not affiliated to AMOSS, Local Natural History Societies. Why not ask university lecturers in relevant departments (Geography, urban planning etc) if they would assign “ward audits” as a course option. Why not identify schools where sixth formers could work with councillors and a teacher to undertake this work? Hold an awards ceremony for the best done audit? The audits could form a useful baseline for the ward plans, against which future progress could be measured. Identify 4 councillors who are in wards other than those of the ESC/NSC scrutiny chairs who are willing to begin audits. Have them report back on progress, orally, at every subsequent ESC/NSC meeting. For god’s sake, JUST DO IT. Recommendation 008: To circulate the CLASP (Climate Change Local Area Support Programme) Member Briefing Pack to all councillors. If and when CLASP produces new versions, or new documents, will these be circulated as a matter of course to all councillors? Are there other briefing packs (e.g. from ICLEI) and other relevant organisations that might be of use? Can the CLASP update also be sent out to Housing Associations, other Public Sector organisations. Could the Environmental Strategy team liaise with the relevant Executive members in the nine other local authorities that make up GMCA to ensure that other councillors have access to the same information? Recommendation 009: To recommend that, once Neighbourhoods Scrutiny Committee had looked at the sustainable food growth report, Economy Scrutiny Committee considers looking at the poverty and economic aspects of sustainable food growing. Can not these two aspects be conducted in parallel, or better, via a joint Standing Group? Economy Scrutiny Committee could hold another “mini-conference”, ideally before March 2015, along the model of the May 2012 meeting, with not just the Manchester Food Board, but practitioners from (greater) Manchester projects. The findings of this should surely be included in the development of the Community Strategy, no? A policy framework for the city’s development of a sustainable and ethical food economy: it will be produced by the Food Board and validated through the scrutiny process. Investigate the possibility of bringing forward the report of the Manchester Food Board. Recommendation 010: To recommend that environmental policies are strengthened through the Council’s planning process. This is a pretty vague recommendation. “Is the “planning process” adequate, in terms of environmental considerations? What IS the planning process? Can it be connected in some way to the AGMA spatial strategy revision? Is it not a good idea to build in some specific aspect – e.g. exceeding building regulations on insulation standards? External stakeholders are at an enormous disadvantage because of the very opaque and confusing planning processes and procedures. Anything the committees can do to lessen that disadvantage is in the long-term interests of the Council and the city. Request that a simplified flowchart of the “planning process” is produced for the benefit of councillors – and others. Recommendation 011: To recommend that the Council continues to include environmental considerations when selecting a supplier, through the implementation of its Sustainable Procurement Policy. And that the impact of the policy is reviewed and that it is updated as required. The “10%” weighting for sustainability is an encouraging trend! The Council needs to communicate better what it is doing, and why. Agree frequency for reporting and updating of the Sustainable Procurement Policy. Reports should include examples of suppliers whose contracts were not renewed/were extensively modified – otherwise there will be a suspicion that the policy is a tick-box exercise with no teeth. Recommendation 012: To recommend that the Economic Development Unit, Corporate Procurement, Environmental Strategy and other relevant departments continue to implement the Council’s Sustainable Procurement Policy, using procurement as a tool to support sustainable economic development, including the achievement of environmental outcomes. Could be merged with recommendation 11? Invite Economic Development Unit and Corporate Procurement Unit to produce brief reports on their use of the Sustainable Procurement Policy. What scope is there for strengthening the policy? Recommendation 13: To recommend that the Association of Greater Manchester Authorities (AGMA) and the Greater Manchester Combined Authority (GMCA) work with CLES to determine what proportion of their procurement budget stays within Greater Manchester, and considers revising their procurement policies to maximise this. Big question – how does the proposed “Trans-Atlantic Trade and Investment Partnership” affect the Council/AGMAs ability to act in this way? Can this somehow be grounded in a) size of council budget and b) size of Manchester economy – to give an idea of real impact. A report will either have been produced or an oral update given to both Economy Scrutiny and Neighbourhoods Scrutiny. Establish a date by which the Council’s Head of Corporate Procurement will have completed his work with AGMA and will be able to present a “Social Values Evaluation Framework” to the Neighbourhoods Scrutiny and Economy Scrutiny Committees. Are we talking 6 weeks? 6 months? 6 years? Request report that lists what changes in proportion of procurement budgets has stayed within Greater Manchester, broken down for each of the 10 local authorities. Invite representatives from the top three local authorities to attend Economy Scrutiny to explain how they did it. Recommendation 014: To recommend that corporate communications and awareness raising on environmental matters should be improved. What exactly is meant by “corporate communications”? Is that purely internal to the Council? The “Communications” Task and Finish Group’s recommendations are circulated for comment to all the scrutiny committees, and to all people who have attended scrutiny meetings or council events. The Neighbourhoods Scrutiny Committee agreed at its September meeting to request a report, to be presented in January 2015, on the roll-out of Carbon Literacy training to councillors, with “lessons learnt”. This report could also come to Economy Scrutiny. Request an “impact report” of the Carbon Literacy training that has already taken place for employees. Have council employees found it useful? What behaviours have they changed? How does Manchester City Council compare to other councils in trying to create a “low carbon culture”? What is a “low carbon culture” by the way? Surely somebody should come up with a draft definition? “Project Odysseus” data to be included in monthly Environmental Dashboard. Recommendation 015: To recommend that officers investigate carrying out a campaign to raise awareness of how people can make changes to reduce their impact on the environment. This campaign should link to wider cultural and behaviour change activity by the Council and other key partners such as universities and schools. But keep this in proportion – it is not individual behaviour change that will ‘save the planet’ but the behaviour of organisations. So be clear about what this is for – a legitimate goal is to increase awareness and consent to radical environmentally safe policies. Recommendation 016: That the Council develops an energy policy which reflects the priorities identified in the investigation. Our understanding is that this important area was added to the working group’s recommendations at a fairly late stage in its process. Some further work is needed to tie it in with the rest of the work, possibly on the lines of the work on food – the policy should cover fuel sources (emphasising renewables), fuel use (with a clear ‘energy descent plan’) and economic justice ( especially fuel poverty). Beginnings of a local energy strategy. Bring the “”review and options” appraisal that is conducted at the October Environmental Strategy Programme Board to November 2014 Economy Scrutiny and Neighbourhoods Scrutiny as reports for information. Recommendation 017: To recommend that all Executive reports include consideration of the impact the decision has on the environment. The response in implementation plan two “the recommendation is being considered” is not SMART. When? By who? Please define “Executive Reports” – are these reports to the Executive (cabinet) of the council? Again, a proforma would help that steers report writers to answer the relevant questions. There is a danger though that this could be tokenistic: how can this be made to ‘bite’? An Executive Member could show up. That would demonstrate some respect for the process of scrutiny. There will be a new section in every report!! A member of the Executive should be asked to come to the Neighbourhoods and Economy Scrutiny Committees and explain why no written response was given to this in the September implementation report, six months after the two committees accepted the recommendations. And to give an update on what decision has been taken and when it will be rolled out. Recommendation 018: To recommend that the Economy Scrutiny Committee monitor the implementation of these recommendations. Given the serious difficulties in getting an acceptable implementation plan, with SMART goals, it might help if there were to be a monthly progress report, with specific goals and a “traffic light” system that can highlight progress. Members of the public and organisations should be sent this monthly progress report and invited to submit their ideas, offers of help etc. There is both action and SMART goals. A monthly dashboard for Environmental activity is established, that includes the recommendations (with refinements) laid out in this report. The dashboard is included in the overview report of both Neighbourhoods and Economy Scrutiny Committees, and also circulated to other councillors, other stakeholders. The quarterly progress reports on the Climate Change Action Plan (promised by the Executive Member for the Environment in February 2014) are instituted. Given the number and variety of reports/requests for information already generated, it is clear that these items cannot fit within the existing forward plans of the Neighbourhoods and Economy Scrutiny Committees. A short-term solution might be to (re-)establish an Environmental Sustainability Subgroup or standing group. The only viable long-term solution is to create a seventh Environmental Scrutiny Committee. As I’ve said to you personally, this is such a brilliant, exciting and revolutionary idea, Marc! All of you ‘Greens’ out there need to get involved with this – the more the better! It will take some effort to wade through all the ‘bumph’ but I am convinced that it will be worth it. As Marc says, “just do it”! From what I interpret from this, is that a predominately white middle-class group advices another white middle-class group of politicians, waht is good for the community and environment? If you like, Patrick. Not quite sure how whiteness comes into it. Could do the whole “not everyone who has contributed to this is middle-class” thing, but so what? I think you’re just class-baiting, basically, and I am disappointed in you. What we are trying to do here is WRITE THE IMPLEMENTATION PLAN that Manchester City Council’s bureaucrats can’t be bothered (or, worse, aren’t intellectually capable of) doing. Do you want to see a responsive state? Do you want “ordinary people” to start thinking about how to make things happen? I do. That’s why I set up the People’s Environmental Scrutiny Team. Complete with the skills audit that people can take, where they identify what they are good at and what they would LIKE to be good at. But if you like, I’ll add a question about class, and then disregard all the people who tick “middle-class”. Would that make the whole thing acceptable to you? Eh?